The Mackie SP260 will become the heart of your PA system! Five different operating modes cover a wide range of systems. Each input and outpu.. The Mackie SP260 will become the heart of your PA system! Five different operating modes cover a wide range of systems. Each input and output is loaded with a huge range of processing including flexible EQ, crossover, delay and limiting solutions. It delivers everything you need to professionally optimize loudspeaker systems of nearly any size. The SP260 utilizes high-end 24-bit AKM AD/DA converters with 120dB dynamic range for class-leading sound quality. With 24 user-definable presets and flexible I/O for simple routing and configuration, the SP260 is an ultra-flexible processor, ideal for a wide range of portable and permanent applications. The Mackie SP260 has two inputs that instantly connect your mix into a whole host of processing and routing capabilities. Your input signal will never be the same. It will be better thanks to the SP260. Each input features a mute switch and variable gain control. Now, you can easily control the whole system regardless of how many boxes you have. Turn these down and the entire system turns down. Easy, right? But, that’s just where it starts. The Mackie SP260 features 5-band EQ on both inputs. You can choose between parametric or hi/lo shelving, providing an extremely flexible approach to room tuning that is sure to please any professional engineer. There’s even a 600ms delay available on each input. This is great when using multiple Mackie SP260s to drive delay stacks in really big venues. Or, you could go crazy and time align the stage with the main speakers. No one is watching and I am sure it will make all the difference in the world. If you are like us, this is what you would be doing. There are six individual outputs on the Mackie SP260 providing a wide range of possible connections, depending on your system. To start, each output features a mute switch and individual gain adjustment. This allows you to turn up the subs for a bit of more low end or get a little more volume to another zone without having to walk out and adjust the power amps. Each output also features a dedicated 7-band EQ, complete with selectable parametric or shelving control per band. This feature is critical for properly voicing a loudspeaker for the program material being presented or for the venue it is in. Adjusting the voicing with this comprehensive EQ control allows you dial in the perfect response curve for the system and application at hand. There are many other ways to optimize your passive or active loudspeaker system. The Mackie SP260 high and low pass filters allow you to easily create a crossover for your full-range speakers and subs or bi-/tri-amped systems. These filters also allow you to roll off frequencies your speaker may not be able to handle. This helps to focus energy where it’s needed, preventing needless heat loss and possible driver over-excursion. There are eight different types of filters available with varying degree of slope. The following types are available with slope choices in the first through fourth order: Butterworth, Bessel and Linkwitz-Reilly. For each output, you also get to choose input routing, from input A, input B or a mono sum of both (great for subwoofers or for sending a mono feed to the foyer). There’s also a 600ms delay on each output, giving you a wide range of control. You can use it to create delay stacks down the street at a block party. Maybe extra coverage is needed in a balcony for service. You will want to time align that signal for sure. But, if you want to get uber-professional you can take advantage of the fact that the Mackie SP260 can adjust delay down to 20 microsecond increments. This allows you to time-align drivers on stage to provide the best possible summing. The display conveniently lets you see delay in ms, feet or meters depending on the situation. Combine this with the polarity invert feature for a system that is perfectly summed for optimum response. There’s even a powerful limiter to protect your system from an overzealous guest engineer intent on punishing your system. A system lock feature keeps your system safe from the occasional (and, of course, accidental) bump. You can even impose a password protection system that keeps out people who intentionally want to adjust your system. Not that there are people out there who would do that. It is just not possible, right? The Mackie SP260 is specifically designed for the professional audio engineer. If you know your Butterworths from your Bessels, or if Linkwitz-Reily is your middle name, the SP260 gives you total control over every single parameter. Let’s make a deal. You adjust the system based on the venue and gear and we will ensure premium sound quality. With high-end AKM AD/DA converters with 120 dB dynamic range and a sophisticated DSP engine and algorithms, you can count on superior sound quality each and every night. It starts as soon as you plug the Mackie SP260 in. You can easily choose from a range of pre-configured system setups to assign the correct inputs, name outputs and provide the starting crossover point for your system. This saves time when dealing with complicated systems that involve zone control, cry rooms or with bi- or tri-amped loudspeakers. From there, use all the available input and output processing to optimize your system for the venue. Once that’s done, you can easily save the setup in one of the 24 available presets. This is great when you use your system in the same place often or switch between different sets of gear, depending on the venue. We’ve even created downloadable presets for popular Mackie systems that give you a huge head start for setup. Plus, with the ability to link inputs or any combination of outputs, you can save serious time adjusting parameters that you intend to repeat on other channels. 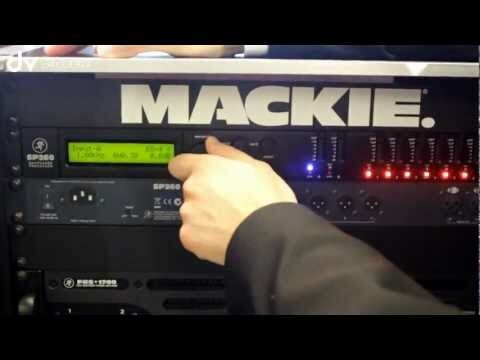 With the Mackie SP260 Control Application, you have total control over your system from an easy-to-use interface. Just plug in your windows laptop via the convenient front panel USB port to harness the power of the app. The software auto-detects the SP260 and shows the current settings. Each and every SP260 feature is controllable using the app, which features a high-contrast design perfect for low-lit areas like Front of House. The smart design of the app is built around maximum workflow, so all processing elements for any input or output are viewable and controllable from a single screen. You can even manage and store your presets on the PC for later implementation. This allows you to setup for shows ahead of time or adjust things you’d like to improve for the next show. Passive, powered, bi-amped, tri-amped, delay stacks, fill stacks, cry rooms and balcony clusters. Everything is manageable with the SP260. Getting total control over your system has never been easier. Having it sound so professional has never been more affordable. If you’ve read down this far, I suppose I can have some fun. The SP260 is a potent piece that perfects and protects your precious powered or passive PA. Phew! Purchase please!